One very large industry that uses alginate is the Orthotics and Prosthetics industry (O&P). 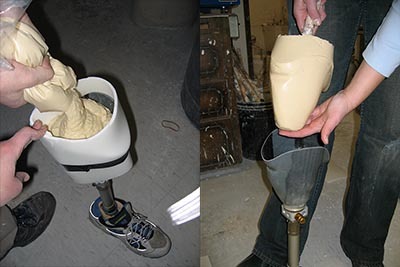 When a prosthetic leg socket begins to wear out, it can be duplicated or a new socket can be constructed. In either case, a mold must be made- either of the inside of the existing socket or of the residual limb. These molds are used to manufacture a new socket for the patient. 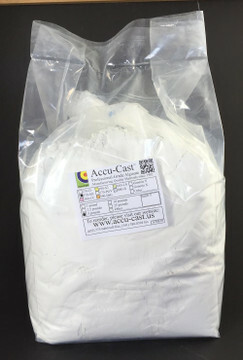 Accu-Cast's 370-SD alginate has been formulated to have ideal properties for this work. Sold by Southern Prosthetic Supply, Cascade Orthopedic Supply and a host of others, this product really fits the bill for prosthetics work. Sometimes the patient is perfectly happy with their existing socket, but it is just wearing out and needs replacement. A new one could be fabricated from the ground up, but most of the time duplicating the old one is a good, economical solution to their problem. This product is also available through Southern Prosthetic Supply, Cascade Orthopedic Supply, Empire Medical and other suppliers. When the alginate sets up the alginate is removed- looking like a large white Popsicle. A release is put into the plaster bandage shell and a plaster "positive" is poured into it. This is the structure upon which the new socket is fabricated. Sockets are made from fiberglass or carbon fiber or some combination of the two. The most important things for alginate to do in this procedure is to mix quickly, pour easily, set quickly and have the proper firm/hard consistency when set. 370-SD alginate is perfect for this.